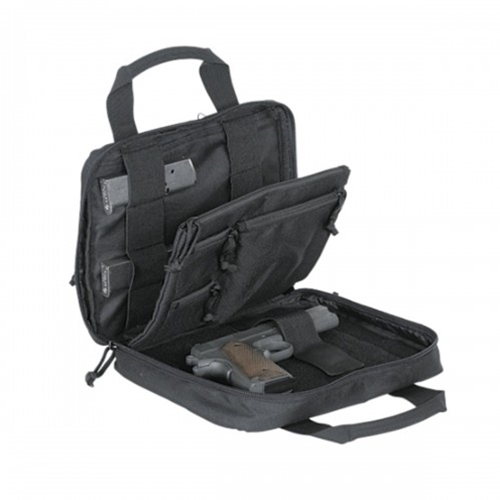 Looks like a ordinary admin case but inside there's storage for your pistol and 8 magazines. The center divider is actually a large zippered accessory pouch with three smaller zippered pouches sewn to it for tools or small parts. The pistol side has a adjustable retention strap to secure and place your pistol anywhere on the soft hook-n-loop mat. There is also a hook-n-loop pouch under the pistol side. The outside features a full length zippered pocket and ample soft hook-n-loop to attach your name tape or favorite unit patch. The case also includes main pouch locking zippers.